It was a cold winter Sunday morning when a teenager was woken from her sleep with a gentle touch of her mother’s hand caressing her hair. “Open your eyes love. It’s time you learn to make a decent cup of tea!’” said her mother. “5 more minutes Amma”, the sleepy voice begged. But her mother knew that these 5 minutes will drag on and it will be 15 minutes or 30 minutes or 1 hour before her daughter finally opened her eyes! “Oh no! You don’t get 5 minutes!” mother said while literally dragging her first born into the kitchen to prepare 2 cups of Indian Masala tea. 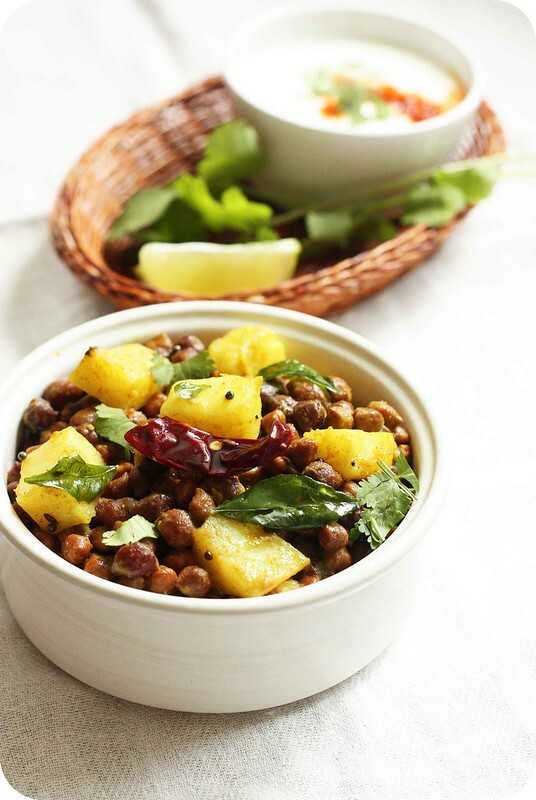 Aloo-Kala Chana Chaat/Potato-Black Chickpeas Salad ~ Quick to make and delicious in taste! That was probably the first time I ‘cooked’ something by myself with my mother standing next to me guiding in measuring the ingredients and instructing me the cooking technique. It was different thing that it took her 5 minutes to pick herself from floor after rolling on the said kitchen floor and laughing out loud looking at me trying to light the gas burner standing 2 feet away as if it would explode on my face any moment! I was a moody cook and unwilling learner, but my mother never lost her patience in her quest to teach me few of my favourite recipes. 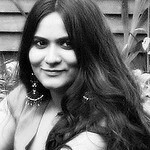 She never forced me to learn cooking just because that’s what good Indian girls are supposed to do. She wanted me to learn basic cooking as she wanted me to stay independent and never depend on others for my survival. 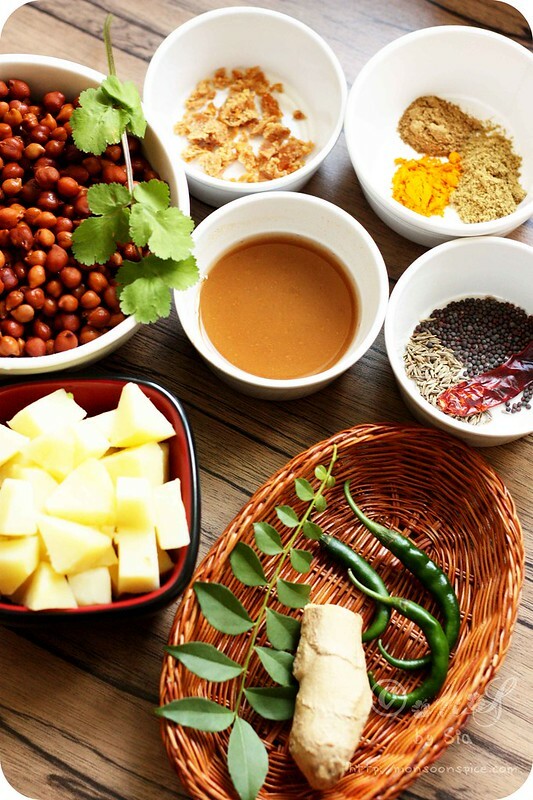 According to her cooking is one of the many essential life skills that one has to learn in order to not only survive, but to successfully make healthy eating choice and hence take full control of the food that nourishes ones body and soul. She firmly believed and believes that when we learn to control the type of food that enters our body, we will be able to cope with every challenge that life throws at us and for that we need a sound mind in a sound body! Simple philosophy of life really, but it took me little longer to actually understand it! When the time came for me to pack my bags and leave home, I was eager to live an independent life where I was solely responsible for making decisions about my study hours to night curfew times to food choices. For the first month I indulged big time on all kind of unhealthy food choices that my mother strictly put under the category of junk foods. But at the end of month all I craved were the simple home food which were unpalatable and stamped as boring few weeks backs! When I spoke to my mother a day before visiting home, I think I surprised her big time by begging for simple everyday meal. From that day onwards, my incessant complaints and whining stopped whenever she asked me to sit in the kitchen and watch her cooking. Although I was not overly eager to master the art of cooking or gave much attention while she went on creating magic in her kitchen, the little spark of interest in cooking was ignited in corner of my mind. Little did I know that I was already picking up basic skills while chatting and munching on the goodies prepared by my mother as I watched her cook with love! 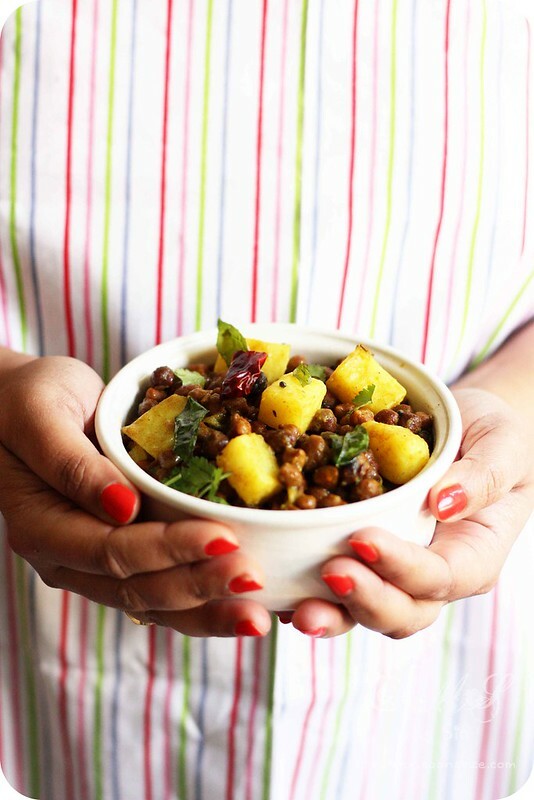 Aloo-Kala Chana Chaat ~ Guilt-free snacking or anytime meal! Years went by and I continued to walk on a path I ambitiously carved for myself in academic field and cooking was pushed to the corner while devoured the numbers, facts and theories on text books and lost myself among the characters of novels, stories and poems. Every kind of books became my best friends and my object of affection, but cookbooks still remained a great mystery of my life! It was only after I got married and moved to different country, I found myself eating the same food cooked by my husband day in and day after! It didn’t take me a long time find out that my life partner not only survived but also flourished eating same food for the past 2 years of his student life! I was doomed! The photos of delicious looking food he sent me with him smiling nicely to the camera had me the visions of marrying a home chef who had mastered the art of cooking! 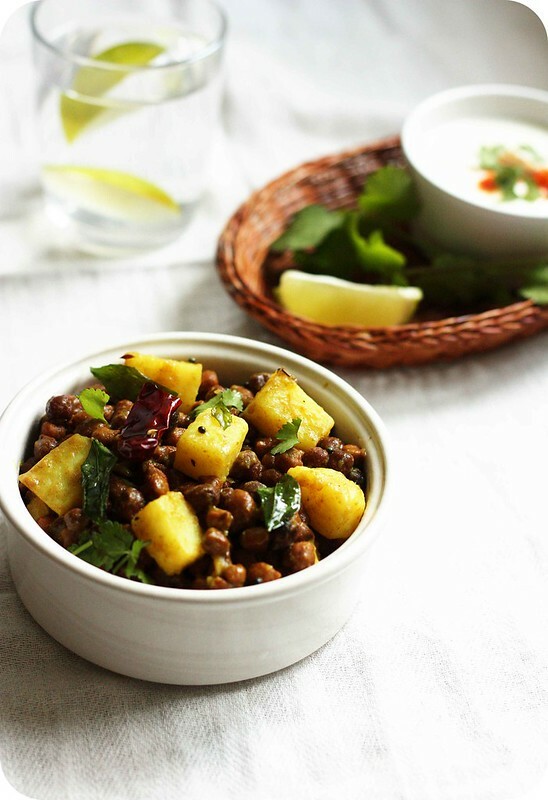 Aloo-Kala Chana Chaat or Warm Potato-Black Chickpeas Salad ~ Dig in! 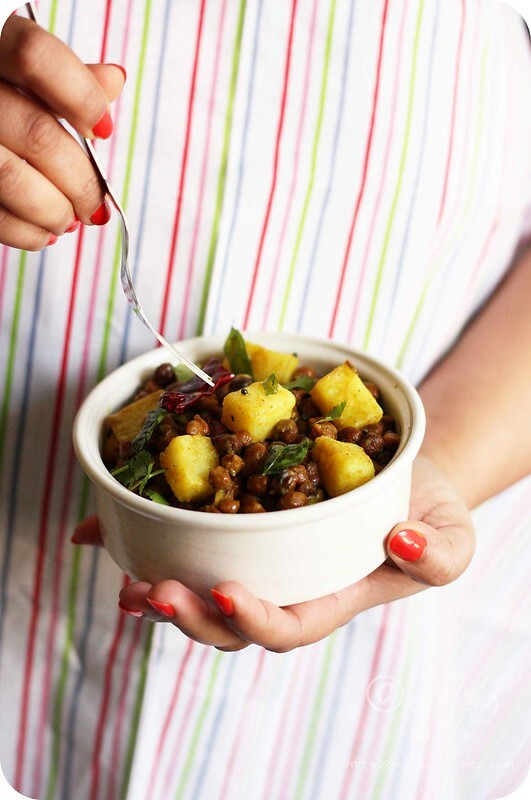 So here it is… Quick and simple Aloo-Kala Chana Chaat or Warm Black Chickpeas and Potato Salad with spiced tamarind dressing, perfect for the kind of weather which we are having these days with spells of sunshine in between drizzles or gale of wind! It is neither too warm nor too cold kind of weather and all I wanted to eat on a days when DH is out of town is this bowl of Aloo-Kala Chana Chaat. Surprisingly Lil Dumpling loves this Black Chickpeas and Potato Salad as much as I do and on days when I am not very eager to cook something elaborate, this comes to my rescue. I make it less spicy for his delicate palate, but slowly he is started to like and enjoy complex flavoured Indian food and I am thrilled about the variety of food I can cook for him. While Lil Dumpling eats a bowl of Aloo-Kala Chana Chaat with Chapatti and Dal, I polish off rather a large bowl of this goodness with a bowl of chilled yogurt or tall glass of spiced buttermilk. Soak tamarind pulp in ¼ cup of warm water to extract its juice. Discard the pulp once the juice is extracted. 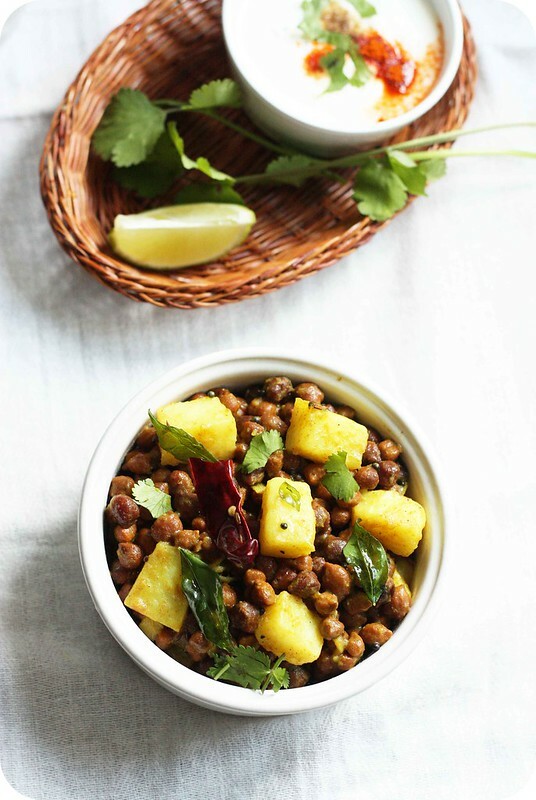 Add roasted coriander powder, cumin powder, turmeric powder and chaat masala if using to the tamarind extract and mix them well. Keep it aside until needed. Heat oil in a pan on medium flame and add mustard seeds to it. When it starts to pop and splutter, add cumin seeds, dry red chilli, hing and curry leaves. Once the cumin seeds start to change its colour and sizzles, about 20 seconds, reduce the heat to low. Mix in slit green chillies tamarind dressing and mix them well. Let it cook on low flame for a minute. Next jaggery finely chopped ginger and salt to taste and let it cook for a minute or two until the jaggery dissolves. Add cooked black chickpeas and sauté them for about 4-5 minutes so that the spices nicely coat them and the chickpeas are heated through. Now add boiled and cubed potatoes and gently fold into the black chickpeas mixture, taking care not to break the potato pieces. Adjust the seasonings and let it cook for 3-4 minutes before switching off the gas. 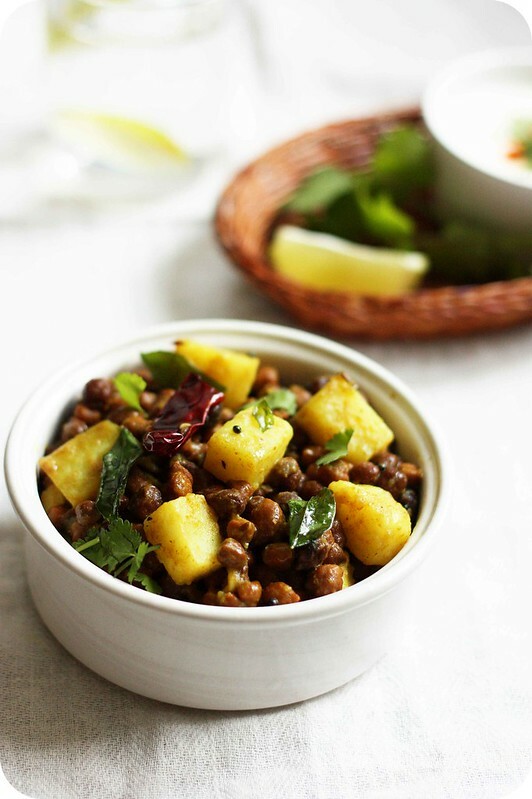 Serve this delicious Aloo-Kala Channa Chaat or Indian Potato and Black Chickpeas Salad warm topped with sprinkling of Chaat Masala, finely chopped coriander leaves and a wedge of Lime. Enjoy! 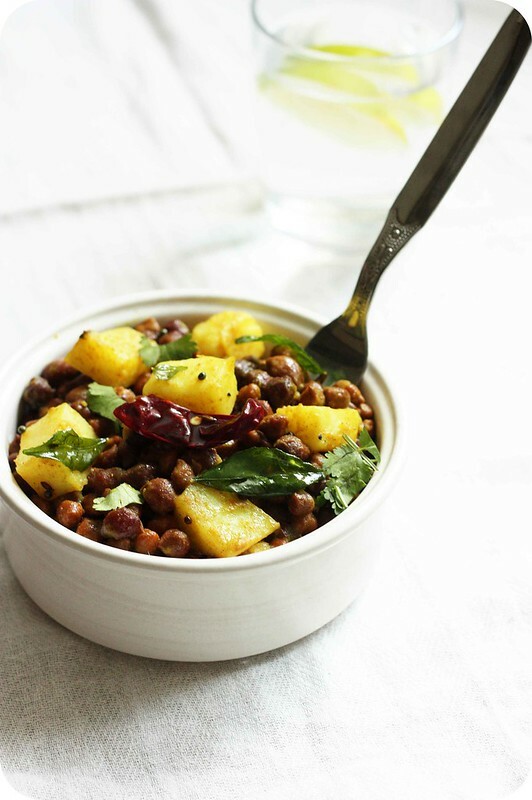 There are many ways you can serve this simple and delicious Aloo-Kala Chana Chaat or Potato and Black Chickpeas Salad. I like mine with a wedge of lemon and a bowl of chilled yogurt or tall glass of spicy buttermilk where as my little one likes it paired with a chapatti and dal. You can use it as a filling for wraps or pita bread with salad leaves and sour cream. 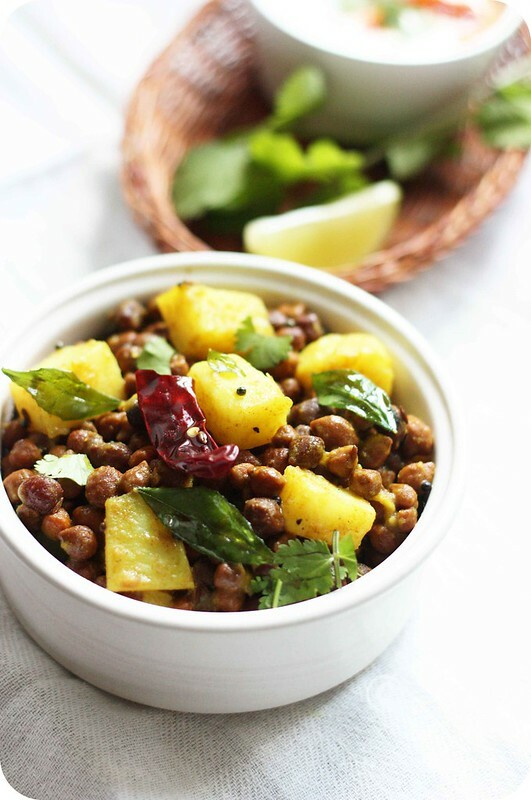 Replace black chickpeas with garbanzo or Kabuli chana for different flavour. 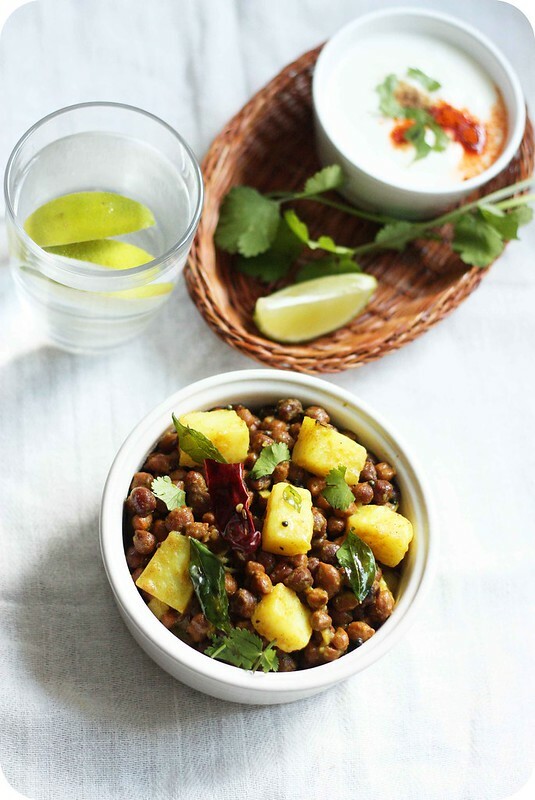 You can also garnish the bowl of Aloo-Kala Chana Chaat with a spoonful of finely chopped onion, tomato, cucumber and fried sev for taste and texture. Splendid! This mouthwatering salad must be ever so scrumptious. Ummm...lovely chaat Sia. I think I am going to make it soon. The idea of eating a warm salad with chilled yogurt sound just perfect. Hi Sia, This is my first time here. Simply loved your space. A mouth watering update! would using organic potatoes make difference in taste?